Always a great experience with Colin and his team including Richard and Natalie. It doesn't matter who you are, everyone is treated fairly and with respect. 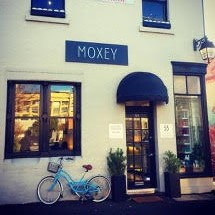 I never hesitate to mention or refer Colin Moxey Salon to friends. It's always a pleasure to visit Colin Moxley Hairdressing and made to feel special. I always leave with an excellent cut and style thanks to Richard's expertise. Colin did an excellent job, and made me feel like I've known him for years. Will definitely be returning! Our pleasure Sharon! We totally love looking after you!